1940's Wartime Fashion - Paint your own stockings! 1940’s Wartime Fashion – Paint your own stockings! 1940’s War Fashion – Paint your own stockings! Q: What’s a 1940s wife more afraid of finding on her man than lipstick on his collar? A: Leg paint on his back! Nylon stockings exploded into the average American woman’s life in 1939, when Dupont began manufacturing the alluring synthetic. Eager shoppers snapped up the new nylons across the country, though they were not particularly cheap in the beginning, most retailing as high as silk stockings. Demand in the USA was extraordinary and by the onset of war, Dupont could not keep up. However the advent of war brought a sudden drop in the availability of nylon as Dupont shifted into a war footing and production turned to parachutes, bomber tires etc. In comparison to their British counterparts who had to wait until the Yanks entered the war before most women other than the rich would set their eyes on a genuine pair of nylons, American ladies had it good. Shelves were empty but discerning women could still afford a few pairs a year. 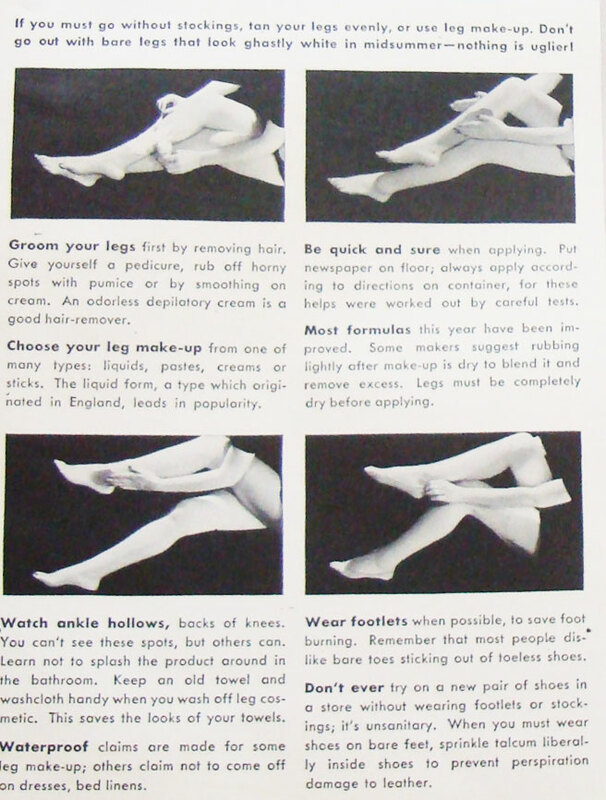 However it was now considered patriotic for American women to hand in their nylons for the war effort and opt for the various leg cosmetics that were available to them from manufacturers such as Elizabeth Arden [ Velva Leg Film]. Though many leg cosmetics had been around since the 1920s, it was the rationing of the 1940s’ that made them a necessary evil. Soon product names like ‘Stockingless Cream’, ‘Leg Art’, ‘Liquid Stockings’ and ‘Leg Stick’ were known to every woman from age 16 upwards. 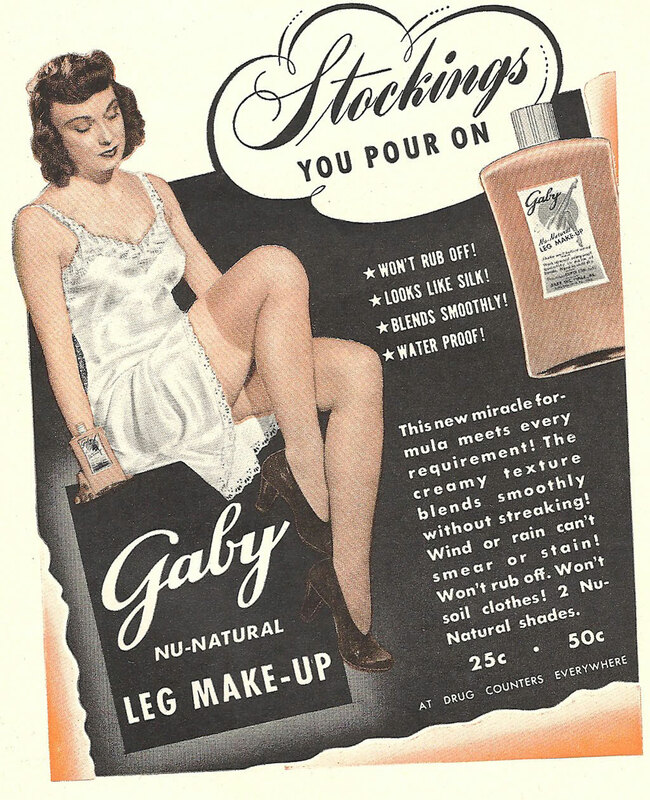 Popular brands included Max Factors Pan stick,Helena Rubinstein’s Leg Stick, Ann Barton’s Leg make-up,Leg Charm from Cosmetic House and Harriet Hubbard Ayer’s Stocking Lotion. Over in Blighty, most women were not so fortunate for shopping options. 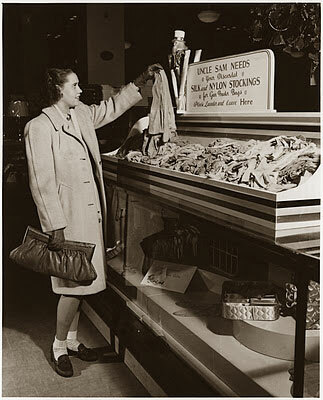 Each woman was issued just 60 coupons a year and two were allocated for stockings [ silk ]. When a British lass had no money for decent leg cosmetics, she would resort to staining her legs with ‘tea’. Oddly enough – it worked quite well on younger legs.Unfortunately, the first sign of rain had women madly dashing for cover less the ‘stockings’ wash off. Very embarrassing and stressful. 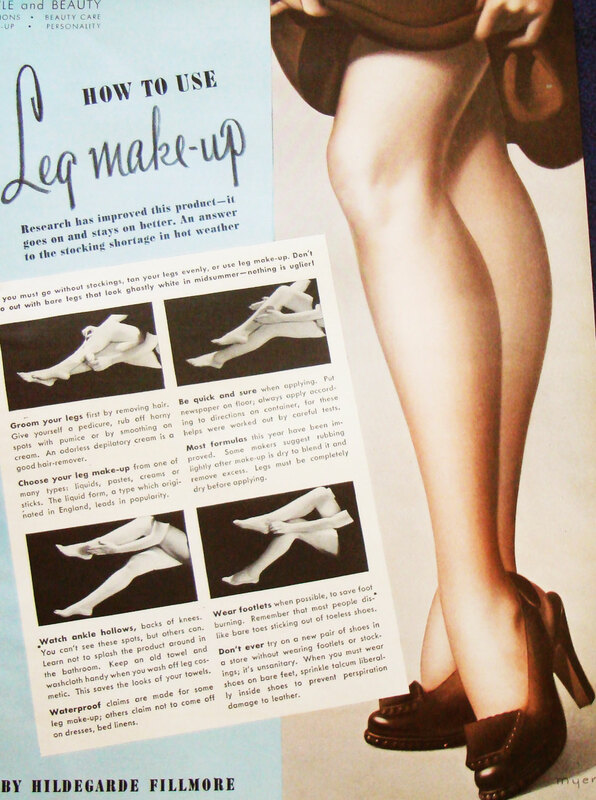 American leg cosmetics were infused with zinc oxide for better cover; talc for simulating the ‘sheen’ of stockings; glycerin to avoid flaking; and latex or some other adhesive to assist in the makeup staying put in bad weather. Good stocking cosmetics had to have fashionable colors to choose from, go on evenly without streaking, dry quickly and not rub off on her skirt or shoes. How to Apply Cosmetic stockings. Purchasing the goods was only the start of the fun. Girls had to keep their legs perfectly smooth, shave a full day before intending to apply the leg makeup, mitt and exfoliate morning and night. Now while many girls do this every now and then these days, the daily beauty regime of a 1940s woman was quite an endurance test. Applying cosmetic stockings took lots of practice, usually with the help of a girl friend when it came to the all important application of the stocking seams. One major issue that had many a girl scream in despair was a sudden flaking of skin when her leg was almost finished, causing an immediate streak. A good bath and lathering was necessary first, then a careful shave, followed by a vigorous leg scrub. Heels and toes were always difficult and needed nightly scrubbing to keep those calluses down. You would then finish by smoothing on body lotion. this basic regular beauty workout was a good prep for applying your stockings. Whatever type – lotion or cream; or color you preferred, it was always advised to experiment a bit first and ask your friends which flattered you the most. If lotion was your choice, you poured it into the palm of your hand and then using the fingers of the other hand, apply the makeup from just above the knee down to the tips of the toes, working in one direction, watching ankle hollows and behind the knees. Wait until dry and then rub down with a clean cloth to remove any powdery remains and streaks. If you used a stick, then it was advised to apply directly and then using the palms of your hands, smooth any overlaps and wipe off excess. You then finished off with a light dusting of silken powder to give that sheen finish of nylons. One of the most popular leg makeups of the time was Elizabeth Arden’s Velva leg. Her cosmetic stocking was said to really achieve the look of genuine sheer nylons, with a special buffer included to give your legs a good buffing; as you might with your car. to a woman who was determined to achieve knockout legs for that important dance. Women became regular Picassos with their eyeliner pencil. There were devices sold that enabled one to affect a reasonable line, but one had to be a dab hand. Read about the History of Make-up – The 1940’s. Very informative post. The prep sounds a bit like that required for a fake tan.